We've had to change our plans for grammar, Advance Language Lessons is on hold, and Bobs needs to be using something this year. I am not proficient in grammar, thanks to the legacy of our NZ school system, so *I* need a guide to help us through this aspect of language arts. After looking at many options, I really do mean many, and with the help of other home educators who had been there, or are doing this, we purchased Rod and Staff. On others advise, I chose Level 5, Following the Plan, for Bobs on purpose. I wanted to be sure he really did have the basic grammar topics sorted before we moved on. Much of this book has been review, thanks to FLL, and we're moving through it pretty quickly which is a great confidence booster for Bobs, who assures me that he likes these books. We've been going through Level 5 orally, and will continue to do so until he needs to start doing portions of the diagramming lessons we haven't encountered in our FLL journey. We use Rod and Staff for the grammar portion of their book only, skipping the writing portions. and in our scheduled 'creative' writing weeks (where Bobs and Daisy write letters or poetry). Daisy is just starting her first year of 'formal' grammar and she'll be going through Level 3, Beginning Wisely. I've decide not to use FLL 3 & 4 with her. With RnS level 3 we are just using the grammar portion of the Level 3 book, though she is completing some of the Written Practice (grammar) exercises. Much of this text is turning out to be review for her also, thanks in part to osmosis - her being 'right there' at the table during Bobs grammar instruction to date ☺ . 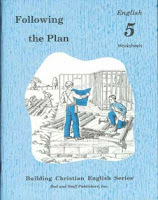 For those wanting to read a concise review about this series of books a Christian homeschooler, Annie Kate, has written one for Curriculum Choice - here and if you'd like a schedule to go with the Rod and Staff English books, pop over to Core Foundations and look under the grammar heading.